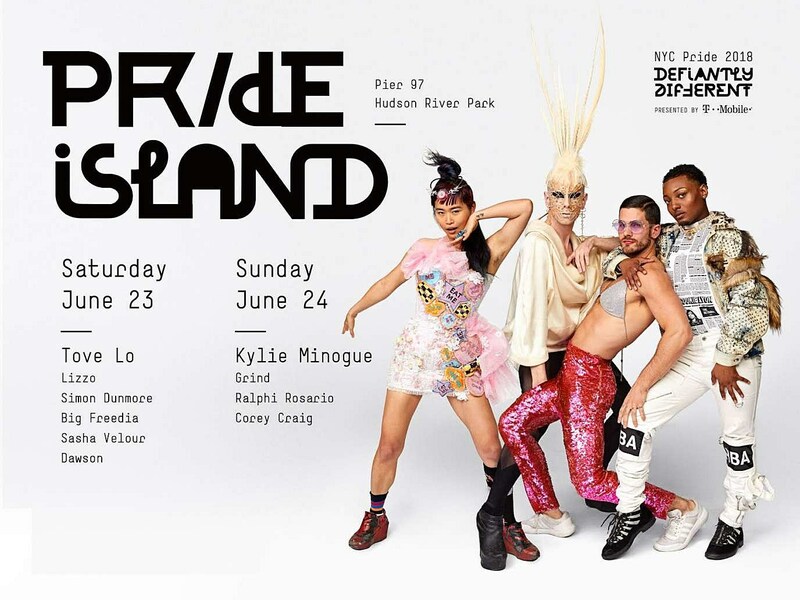 The 2018 edition of Pride Island, the two-day festival that’s part of NYC Pride Week, happens June 23 & 24 at Pier 97 (moving from last year’s Pier 26 location). Tove Lo headlines on Saturday (6/23), and Kylie Minogue headlines on Sunday (6/24). Also playing Friday are Lizzo, Simon Dunmore, Big Freedia, Sasha Velour and Dawson; while Sunday also features DJs Grind, Ralphi Rosario, and Corey Craig. Tickets for Pride Island go on sale Thursday, March 1 at noon. NYC Pride 2018 runs June 15 – 24, culminating with the Pride March on Sunday, June 24. Kyle Minogue, meanwhile, has a new album, Golden, which is out April 6. You can watch the video for single “Dancing,” and check out the album’s artwork and tracklist, below. Saturday, June 23rd: 2 p.m. – 10 p.m.